Happiness Project #35: Pink Lemonade Birthday Cupcakes! Two days ago, my Baby Girl officially became a walking, babbling, contagiously charming Toddler! A Toddler! Something I’m still having a difficult time wrapping my head around! Don’t mind me while I get a little teary eyed at this. Considering that my Sweet Pea is not only my only child but also the light of my life, I was determined to give her the best & yummiest of all 1st birthdays! Which meant showering her with the one thing that I do best; baking. A LOT of baking. Incorporating all of my favorite flavors: chocolate, lemon and vanilla. So after brainstorming a rather exhaustive dessert menu, incorporating HER favorite thing as well, meaning bath-time, I decided that in combination with lemon duck sugar cookies, rainbow cake truffles and chocolate covered strawberries, I wanted to create a special cupcake just for her. A cupcake that represented everything that I love most about my baby girl’s loving, tenacious and incredibly mischievous personality. A cupcake that everyone would love. So what cupcake is it, you ask? A Pink Lemonade Cupcake with Lemon Buttercream Frosting! The perfect blend of sweetness and beauty. The perfect blend of happiness and love. In a baked treat, that is. *Break out that dusty kitchen scale and set it to measuring it’s weight by grams! You will need it for this one! Preheat your oven to 350F. Line two cupcake pans with paper liners. In a small bowl, combine the eggs whites, milk and pink lemonade powder. Mix. Set aside. In a large bowl, on a stand mixer, combine the cake flour, sugar, baking powder & salt and mix with the paddle attachment for 1 to 2 minutes at low speed to blend. Add in the softened butter and 1/3 of the egg white/milk/lemonade mixture. Mix at low speed until the batter gathers together into a moist paste. Beat at medium speed for 1-1/2 minutes to develop structure. *Use a stopwatch or timer for accuracy* Scrap down the sides and bottom of the bowl. This will guarantee a smoother finished batter. Beat in the rest of the egg white/milk/lemonade mixture in 3 batches, beating for exactly 20 seconds after each addition. *Use a stopwatch or timer for accuracy* Do not over mix or the batter will deflate and your cupcakes will not rise correctly. Using a spoon or small cookie scoop, divide the batter evenly between both cupcake pans. Bake for 18-20 minutes, inserting a toothpick, if need be, to check for proper dryness. Do not fret that the top of your cupcakes are not pushed up in the center like a dome. The use of cake flour creates a flat baked surface because of it’s particular density. Cool the cupcakes throughly on a wire rack before frosting. In a large bowl, on a stand mixture, cream the butter for 3 to 4 minutes at medium speed. Drop the mixer speed down to it’s lowest setting and add slowly add in 4 cups of powdered sugar. Once the sugar has been completely incorporated with the butter, beat in the salt, lemon extract and 3 to 4 tablespoons of cream. Whip on high for 3 to 4 minutes until the frosting reaches your preferred texture. If you’re planning on piping on the frosting and the consistency is too soft, cover and chill in the fridge for a few minutes. 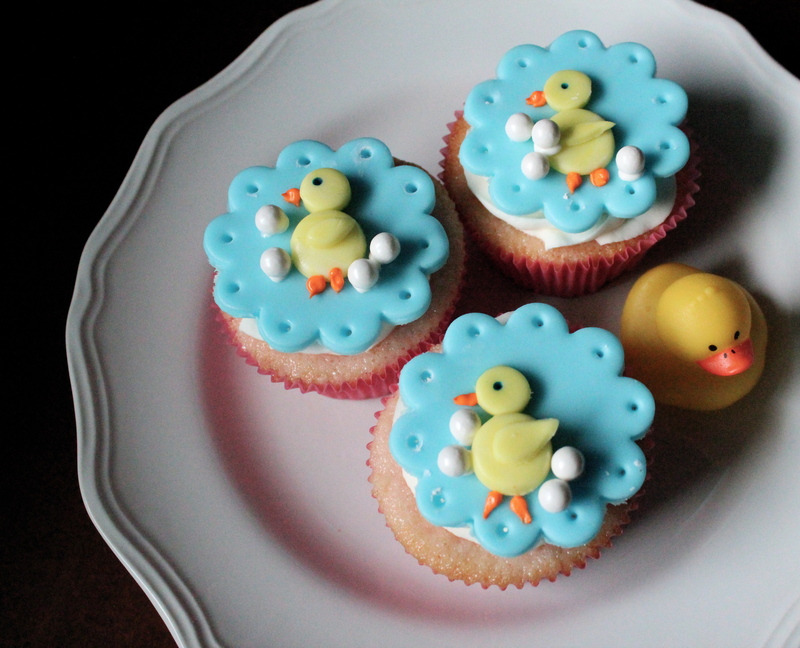 These adorable duckling cupcake toppers were created by the brilliant T-Cakes Franklin! You can find her on Facebook under T-Cakes Franklin. So from this Stealthy Kitchen Mama to you & yours, may every day be filled with a little bit of sweetness and a whole lot of love. Birthdays or not. « Happiness Project #34: Grandma’s Fresh Apple Cake!